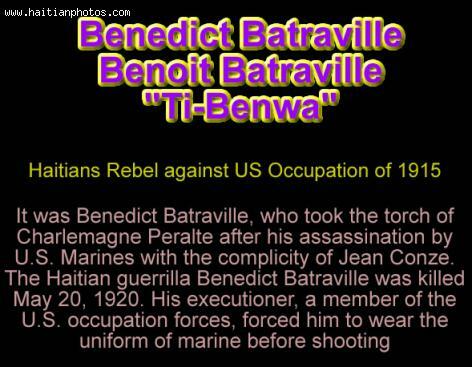 Benedict Batraville was a resistance fighter for anti-American imperialist groups. America began occupying Haiti in 1915 under Woodrow Wilson. In order to weaken the resistance forces, Congress approved of replacing rebel leader, slaughtered Charlemagne Peralte, with his advisor, Batraville. He had a superior intellect and held information about Peralte's military strategy. Benedict Batraville, known as Ti Benwa, agreed with the plan to allow imperialist forces to expand their occupation of the island. But he lay in wait to catch the troops at a disadvantage and push back with the insurgency. The insurgents were successful and the Marines lost territory in Haiti. They understood in order to reclaim lost ground, they needed to find Batraville and finish him off. But he was not easy to apprehend. A master military strategist, who had advised Peralte, Batraville out-thought and out-flanked the Marines. The insurgency lasted 17 months, from May 1920 until October 1921. The Marines decided to break the hold of the insurgency by using captured Haitian insurgents to give up information on Batraville's whereabouts for a bribe. It worked and they found him on the central plateau, where they assassinated him in 1919. In a final act of dishonor, the Marines interred him in a Marine Corps uniform, as much as to say to him, you have betrayed your countrymen. Benedict Batraville was a formidable obstacle to the U.S. Occupation, and a sign the small island of Haiti was not going to accept U.S. occupation lying down.